Volvo has gained global recognition for developing one of the most opulent and safe cars. The company has recently introduced its new flagship sedan, the Volvo S90, in the Indian market in its fully-loaded Inscription trim. The sedan, similar to the entire Volvo product line-up, would be retailed as CBU while replacing the ageing S80 in the Indian market. It comes loaded with a plethora of premium features, while the exterior styling takes cues from Volvo’s latest Scandinavian design language, which has already been seen on the all-new XC90 SUV. For the time being, it has been launched in the diesel fuel trim only as the petrol variant is expected to launch next year. 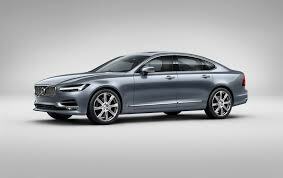 Volvo S90 2016 is up against the likes of BMW 5-Series, Mercedes E-Class, Audi A6 and Jaguar XF. In the past, Volvos didn’t quite hit the spot with Indian car buyers as they fell short on the showiness expected of a premium brand. However, that is not the case with Volvo’s all-new line-up built on the new SPA platform. The design is striking while keeping the reassuring simplicity and solidity that has been a Volvo hallmark. The front grille with the concave elements connects the S90 to classic Volvos. A long and low bonnet coupled with a swooping roofline gives the S90 a sleek look and will help it stand out in its segment. It is very nearly a stately fastback. There is a strength in the clean and crisp lines that give the S90 a strong-shouldered look as it runs along the sides and into the tail lamps. The rear of the S90 is also distinctive, with the large tail lamps dominating the design. The creases on the boot help to break the mass, but add a bit of fussiness to the look. The integrated exhaust openings lower down on the fender are a nice touch. Slide into the 2017 Volvo S90’s seats and you’re immersed in an elegant, minimalist cabin that rivals anything from its German contemporaries. This new interior, with its wood inlays and chrome and metal accents wrapping from door to door across the dash, is arguably the S90’s greatest leap from its comparatively tepid predecessor.